Learn how to order a personalized grave marker online by perusing the City Monument Company website or by calling 305-594-4628. Browse the gravestone and headstone design picture galleries and when you find one that you want to order, just click on the link that reads "Place Your Order Online". Then fill out the form with your name, phone number, email address and the cemetery name where the monument will be set above the grave. The City Monumen Company will contact you to help you decide on design options and provide you with a specific price for your customized gravestone. 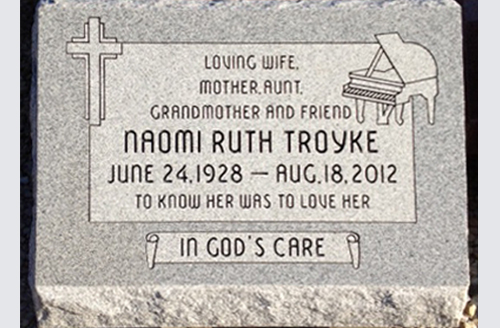 The personalized monument pictured here was customized for the Troyke family to commemorate the life of Naomi Ruth Troyke (June 24, 1928 - August 18, 2012). An engraving of a piano was etched on the front of the slant style grave marker because Naomi was a lover of music. Her grave marker was personalized with an epitaph above her name, birth and death date that reads "Loving Wife, Mother, Aunt, Grandmother and Friend". At the bottom on the front of the slant face grave marker two other epitaphs read "To Know Her Was To Love Her" and "In God's Care". To complete the personalization of the grave marker, a cross was engraved in the top right corner of the headstone. Single slant monument prices start at $1,800.00. Call 305-594-4628 for ordering information. Click here to go to our slant marker photo gallery to view more pictures of granite slant face markers. These types of headstones are often called slant monuments, slant memorials, slanted markers, raised and slanted headstones, cemetery slants, slanted gravestones, slanting memorial markers, mini headstones, slant top gravemarkers or slanted tombstones. View pictures of slant grave marker designs before buying one so that you can get ideas and share them with your family. If you find any that you want a member of your family to see, click on the link above the picture that reads "Email This Design to a Family Member". If you want to know how much a specific headstone costs, click on the "Request a Price Estimate" link above the picture so that we can contact you to provide pricing information. Slanted slanted grave markers are a popular choice because they are easier to see in a cemetery than a flat or lawn level gravestone. They are not as tall as an upright monument but are often less expensive than larger upright monuments. Slanted gravemarkers are often placed on a granite base above the grave. When they are placed on a granite base, they are often described as "slant on base grave markers". These types of memorials generally have a wide base which rises at an angle (45 to 60 degrees) to a tapered top. The front of the monument is slanted making it easier for visitors to the gravesite to read the inscriptions and epitaphs. The marker usually states the name of the deceased and their birth and death dates. The City Monument Company, upon request, can include personal information in the form of epitaphs, inscriptions, sayings, quotes, poems or verses. We can also memorialize the person who died with images of the deceased in the form of hand or laser etchings or porcelain or ceramic portrait photos. The City Monument Company can enhance the appearance of a slant style headstone by creating and attaching a porcelain photograph or ceramic portrait. Unique designs can be etched and carved into slanted grave markers by the expert craftsman at the City Monument Company. These types of cemetery memorials are almost always made from high quality granite. You can choose from multiple design variations. The top of a slant memorial can have a straight, rounded or serpentine shape. Slant shaped grave markers that memorialize the life of one person are referred to as a "single" or "individual" slant markers, while slant shaped grave markers that memorialize the life of two people are described as "companion" or "double" slant markers. Double or companion slant markers are used to designate the location of 2 burial plots in a cemetery or memorial park. Slant markers are a very affordable option. Read example sayings, verses and sample quotes to get ideas for a short epitaph or common inscription for the headstone. Choose from a variety of granite colors. Click here to contact the City Monument Company, headquartered in Miami, Florida. Click here to request a brochure. If you have a question about cemetery memorials, markers or monuments, click here to ask an expert designer. Learn how to order a personalized grave marker, like the one pictured here, by calling the City Monument Company at 305-594-4628. One of our memorial designers can schedule a design consultation meeting to explain the process of ordering a personalized burial plot marker. You are also welcome to place your order over the phone. Our design consultants have been helping families order markers for decades. For driving directions to the showroom where you can order a personalized grave marker, click here. We are one of the most credible momument retailers in the United States. If you want to know how to buy a gravestone, call us and we can explain the various factors you should consider when ordering a customized grave marker for a cemetery. Our staff is very familiar with the rules and regulations specified by local cemeteries in the Miami, Florida area. When you visit our showroom, we will help you decide on the type of materials to be used. Bronze and granite are the most common materials used to make cemetery memorials. We can even design the gravestone on a CAD program while you watch and offer your design suggestions. We have many different example epitaphs and inscriptions for you to choose from during the design and ordering process. Once you have ordered a grave marker, we can provide you with a CAD rendering. During the design consultation, you can compare prices for various types of grave markers and monuments. We don't suggest that our customers order a grave marker impulsively and prefer that our clients take their time to make the right choice. We can also answer any questions you have about delivering the monument to a cemetery and the installation or setting process. Professionally designed cemetery monuments make the process of visiting a gravesite to remember a loved one more enjoyable. The high quality granite cemetery lot markers made at the City Monument Company are the ideal type of gravestone to order for a cemetery memorial. Granite deteriorates at a very slow rate. Our monument company only uses the best memorial quality granite. We purchase our granite from the the best quarries available and offer a wide selection of elegant granite colors. Our manufacturing facility in Miami, Florida has perfected a top-notch grave marker quality control process. To learn more about cemetery monuments and memorials, how they are designed, what they cost, hand etching and laser etching, visit our FAQ page. City Monument Company is uniquely qualified to assist you in selecting and manufacturing your memorial. Unlike many other monument retailers, we design and manufacture our memorials right on the premises, assuring the highest levels of quality and customer service. We are also proud to have our own designers to assist you should you have a special design in mind. Memorials come in a variety of shapes and colors. There are many different sizes, shapes, and colors of granite memorials. They can be flush to the ground (flat), slightly pitched (bevel), slanted (slant), or an upright monument which is usually a tablet on a base. We also offer mausoleums, benches and special memorials for cremains. In choosing a memorial, there are several important decisions that you will need to make.